An artist's illustration of India's Mars Orbiter Mission spacecraft, the country's first Mars-bound probe, which is due to launch toward the Red Planet in Fall 2013. India's first spacecraft bound for Mars is counting down toward a late October launch, a mission that — if successful — could make the country's space agency one of the elite few of space powers to have explored the Red Planet. The Indian Space Research Organization's Mangalyaan spacecraft, or Mars Orbiter Mission (MOM) probe, has arrived at the country’s Satish Dhawan Space Center in Sriharikota to be put atop an already stacked and awaiting Polar Satellite Launch Vehicle. The spacecraft is designed to photograph the Martian surface from orbit and search for signs of methane in the planet's atmosphere, be it expelled by non-biological or microbial sources. Other countries have tried to reach Mars and failed. 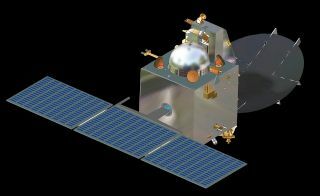 Japan's Nozomi Mars spacecraft failed in its bid to orbit the planet in 1999, while China's Yinghuo-1 Mars orbiter was destroyed when its carrier spacecraft — Russia's Phobos-Grunt — failed to leave Earth orbit in 2011. As India's first Mars mission, the Mangalyaan probe's major objectives are both technological as well as scientific. First, the Mars orbiter showcases the country's spacecraft-building and operations acumen. Second, the probe carries a high-tech suite of sensors to explore the Red Planet's surface features, morphology, mineralogy and Martian atmosphere using indigenous scientific instruments. Lyman Alpha Photometer (LAP): Measures the Deuterium to Hydrogen abundance radio to assess the loss process of water from the planet. Thermal Infrared Imaging Spectrometer (TIS): Provides a map of the composition and mineralogy of the Martian surface, operating day and night. Mars Exospheric Neutral Composition Analyzer (MENCA): Studies the neutral composition of the Martian upper atmosphere. Mars Color Camera (MCC): Images the topography of the Martian surface, keeping an orbiting eye on dynamic events and weather of Mars and will also be used for snapping pictures of the moons of Mars, Phobos and Deimos. Methane Sensor for Mars (MSM): Measures the Martian atmosphere on the lookout for methane (CH4) at several parts per billion levels and maps its sources. Data is acquired only over an illuminated scene as the sensor measures reflected solar radiation. Recent missions to Mars have provided ample direct evidence on Mars for hydrated minerals on the surface, and of water at subsurface regions, said Jitendra Nath Goswami, director of ISRO's Physical Research Laboratory in Ahmedabad, Gujarat, India. India's Mars Orbiter Mission (MOM) probe, or Mangalyaan, is tested prior to launch toward the Red Planet in late October 2013. The possible presence of methane has been proposed, but only based on limited observations, Goswami added. But mysteries remain, including whether such methane emissions are sporadic or localized on Mars, and what their actual sources are, Goswami explained in a co-authored paper on the Indian Mars mission presented earlier this year at the 44th Lunar and Planetary Science Conference in Houston. Whether the Mars atmosphere actually contains traces of methane (or not) has been pursued for many years. The reason is that sniffing out the methane could be a prospective sign of microbial life. However, it also can be produced without biology via geological processes, or by ultraviolet degradation of organic material delivered by the fall of meteorites, or even an inoculation of interplanetary dust particles. The hunt for methane on Mars took a hit in September when scientists announced that observations from NASA's Curiosity Mars rover indicated that the Martian environment lacks the much-sought gas. This was deemed as a surprise to researchers because previous data reported by U.S. and international scientists indicated positive detections. India's Mangalyaan spacecraft won't be the only newcomer at the Red Planet in 2014. In addition to the Indian probe, NASA's Mars Atmosphere and Volatile EvolutioN mission (MAVEN) is also expected to begin its own mission in orbit around the planet next year. NASA plans to launch MAVEN toward Mars on Nov. 18 from Cape Canaveral Air Force Station in Florida. The probe should arrive in Mars orbit in September 2014 like India's Mangalyaan. "As I understand it, they [India] have a broad range of science instruments, and some of them will have synergy with MAVEN science," Bruce Jakosky, MAVEN's lead scientist based at the University of Colorado in Boulder, told SPACE.com. "We've had an initial discussion with them of potential collaboration, but have not made any detailed plans yet for coordination." India's Mars Orbiter Mission (MOM), is poised to launch toward Mars on Oct. 28, 2013. If successful, would signal India's entry into Mars exploration, the fourth space agency to do so. "MOMs" of the world unite! India's Mars Orbiter Mission "fits well within the scientific strategy of a global campaign to understand Mars as a system, with geology, climate, and ultimately 'life' as goals," said James Garvin, chief scientist at NASA's Goddard Space Flight Center in Greenbelt, Md. and a member of the Mars rover Curiosity's imaging science team. In Garvin's view, "Mars will always require a diversified set of vantage points and sensor systems," and India's Mangalyaan mission could contribute to some of the important questions about Mars that, so far, have yet to be addressed at the surface, or from Martian orbit and Earth-based observations. "I am excited by India's MOM mission to Mars and suspect that its methane sensor will provide very interesting new observations that can be tied to those from Curiosity, Europe's ExoMars 2016 Trace Gas orbiter, and to those from Earth-based systems," Garvin told SPACE.com. "Mars is waiting," Garvin said, "and we should not let her down!" Garvin added that over his 30 year career as a NASA Mars scientist, and while in graduate school at Brown University, he has never witnessed a time when researchers were not surprised by what Mars had to offer. "And after all, who could not root for 'MOM? '," Garvin said. "I always root for the Moms of the world."